Liu Xiaobo, professor, writer, literature critic and Human Rights activist – and the first Chinese to win the Peace Nobel Prize in 2010-, was born in Changchun on 28 December 1955. He enrolled in the local university in 1977, after a stay in Inner Mongolia, two years in the countryside of Jilin and a short-term job at a building factory in his hometown. He followed the classic itinerary of his generation: graduated in Literature, he was accepted at the Normal University of Beijing in 1982. Precisely at this stage of his studies, he got himself known by an article, in which he accused the Chinese writers of so-called nouvelle vague of never cutting their umbilical cord with the power and reproached the post-Mao cultural establishment of being obsessioned by the hunt for the Nobel Prize. Liu Xiaobo was not interested in politics at the beginning, and actually he kept himself at a distance also from the Beijing Spring of 1978-79. In 1988, he brilliantly discussed his doctoral thesis. He was invited to hold lessons in Norway and at Columbia University in New York between 1988 and 1989, precisely when the movement for democracy of Spring 1989 broke out in China. While many intellectuals tried to organize the expatriation in case things would worsen, Liu Xiaobo returned to the country to give himself over, body and soul to the movement. From half May, he spent most of his time in Tienanmen square – the scene of the protests – on the side of his students, without ever sparing them his criticism. On 2 June, as the rumors of an upcoming army intervention became more and more insistent, Liu launched together with three comrades a hunger strike to protest against the announced crackdown. In the night of the massacre, between 3 and 4 June, he convinced the students about the necessity to negotiate with the army a peaceful evacuation. He took charge of this, preventing the bloodshed from becoming even more serious. Initially, he finds shelter at the Australian Embassy, but he cannot bear being safe, while thousands students and citizens are tried, jailed and executed. So, on 8 June, he is arrested in Beijing and spent 20 months in the Qincheng prison, described by activist Wei Jingsheng as the “Bastille of the Twentieth century”. "4 June is the day when the martyrs who opened my eyes passed away, every time I open my mouth I wonder if I am worth them ", Liu would then say. From that moment on he would never cease to struggle for the recognition of the massacre. The writer then reached the highly variegated political group of those who struggle for democracy, and launched petition after petition to defend the founders of the independent unions and the citizens who criticized the power. In his battle he met the mothers of Tienanmen square – who unceasingly struggle for the recognition of their children’s sacrifice - and Bao Zunxin, co-founder of the independent association of the intellectuals from Beijing, he too active in the ranks of the opposition. In 1996, upon request of dissident Wang Xizhe he signed a petition for a new cooperation between the Kuomintang (Chinese National Party) and the communist party. This is why, on 8 October 1996, he was sent to spend three years in a labour camp. He would later say he had signed the call out of respect for his friend, rather than because he was really persuaded about it. As soon as he was set free, he resumed his activities to grant China the rule of law. Like Czech dissident Vaclav Havel – who inspired the famous "Charter 08" - he chose to live according to the truth, refusing to write about politics under pseudonym even if this meant to be banned from publishing in China, and he remained firm on his principles. His critical capability did however not prevent him from recognizing the progress accomplished by China, which he considered as the results of its denizens’ resilience and commitment for their own rights. Albeit he was still under surveillance since 1991, he went on publishing his political cronicles in the Hong Kong press or on the Web and he took part in every kind of iniziative aiming at obtaining a political reform of the regime. The most famous one is “Charter 08”, the manifesto drawing inspiration from Charter 77 by Havel, by which he claimed the establishment of true democracy in China, characterized by the separation of powers, the end of the single party dictatorship and the creation of a federation to protect the rights of the minorities. Liu Xiaobo was not its main author, but largely contributed to its spreading. 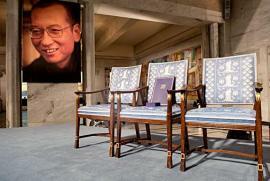 In 2009, Liu Xiaobo was arrested again and sentenced first to 11, then to 12 years in prison. Despite a broad international campaign for his liberation and the awarding of the Peace Nobel Prize in 2010 (whose delivery was symbolically marked by the decision to leave an empty chair), the authorities did not release him, not even precisely to receive the honors. During his detention, Liu fell ill with liver cancer. In 2010, his wife Liu Xia was put under house arrest for seven years in order to prevent her from spreading her husband’s testimony. He was released only on 29 June 2017, when cancer had reached its terminal stage. Liu refused the last treatments, because he hoped to access some therapeutical programmes abroad, not really because he would believe in a now impossible healing, but because with an ultimate love gesture he sought to make it possible for his wife to expatriate to a safe place. Also this demand was denied to him and he passed away, mourned by the whole international community, on 13 July 2017.